For those of you who missed the Collecting South Asia / Archiving South Asia conference last month organized by the UC Berkeley Center for South Asia Studies (CSAS) at the Berkeley Art Museum (BAM), be sure to check out podcasts of the presentations on the CSAS website. Three aspects of the Absolute, page 1 from a manuscripts of the Nath Charit, 1823, by Bulaki, India. Opaque watercolor, gold, and tin alloy on paper. Courtesy of the Mehrangarh Museum Trust, RJS2399. The conference began with a riveting introduction by Lawrence Cohen, UC Berkeley Professor of Anthropology and South & Southeast Asia Studies, about the recent collection of bio metric data in India through the Adhaar national identification program. Cohen’s discussion laid out some of the stakes of creating an archive such as this – what it means to collect certain kinds of information (e.g. about caste), the problems of duplication, and the potential this data has for social and labor development initiatives. As Cohen points out, the archive of Adhaar, that is of people registered in the new ID program, creates a new federation, and as such raises all sorts of interesting questions about community and affiliation. The second part of the introductory panel (“Methodological Predicaments”) was devoted to a behind-the-scenes look at the newly opened exhibition Yoga: The Art of Transformation by Associate Curator Debra Diamond of the Freer / Sackler Galleries at the Smithsonian (the exhibition is now on display at the Asian Art Museum San Francisco). Diamond acknowledged that much of the process of doing art history, particularly when organizing an exhibition, is to create an archive of research interests – to collect images of objects or places, to compile texts and scholarship on a specific topic, and create personal notes about a particular theme or group of artworks. Diamond spoke not only about her strategy for creating this archive of research for the exhibition but also about installation techniques that she used within the gallery spaces to create connections between objects and to convey a specific mood or experience for the viewer. 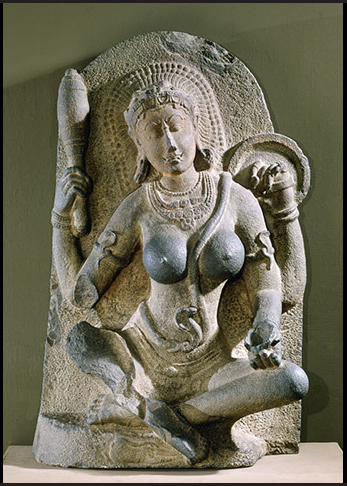 Yogini, 900-975. India; Kanchipuram or Kaveripakkam, Tamil Nadu state. Possibly dolerite. Courtesy of Detroit Institute of Arts, Founders Society Purchase, L.A. Young Fund, 57.88. Following the introductory panel and the methodological and theoretical themes about archiving and collecting that it put forth, the panel “(Un)Making the Episteme: The Nineteenth Century” presented the work of three renowned professors and thinkers. Janice Leoshko, Associate Professor of Art and Art History at the University of Texas at Austin, spoke about late nineteenth- and early twentieth-century practices of collecting South Asian art by exploring the approach to studying Buddhist sculpture in Eastern India by figures such as Alexander Cunningham and Ananda K. Coomaraswamy. Leoshko showed the complex ways in which religion and art were intertwined during this moment in history, and how much of what we see when looking at temples such as Bodhgaya is misleading (e.g. with many Buddhist objects appearing at sites far from where they were originally intended to be worshipped or found during archaeological digs). Expanding on this turn-of-the-century moment and the way in which Buddhist objects were understood, Sugata Ray, conference organizer and Assistant Professor of South Asian Art at UC Berkeley, examined early British perceptions of the Buddha’s body as “effeminate.” Ray revealed that colonial scholarship, and thus the colonial archive, framed South Asian Buddhist images as feminine in style, made by equally effeminate male Indian artists. For the British, these effeminate Buddhas were on the one hand evocative of their purported sense of serenity, peacefulness and enlightenment, and on the other hand reflective of an aesthetic ideal that stood in stark contrast to British (read: neo-Classical) brands of hyper masculinity. 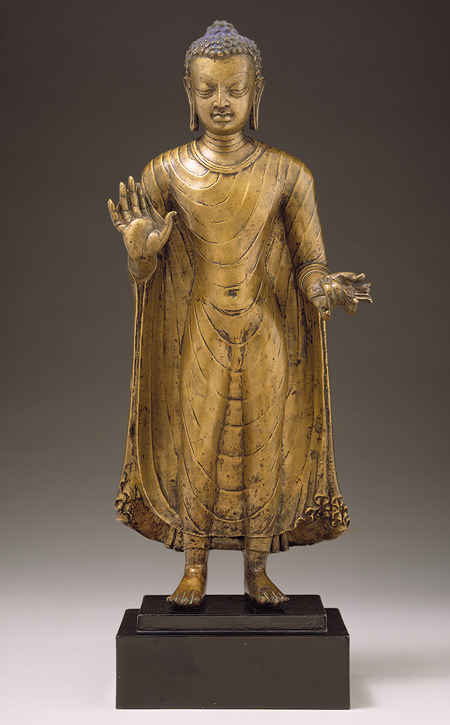 Buddha, Gupta period, second half of 6th century. India (probably Bihar). Bronze; H. 18 1/2 in. (47 cm). Metropolitan Museum of Art, Purchase, Florance Waterbury Bequest, 1969 (69.222). The nineteenth century panel concluded with a talk by Anjali Arondekar, Associate Professor of Feminist Studies at UC Santa Cruz, who examined sexuality and the colonial archive in India by looking at a local legal battle over property rights and tenancy. Arondekar urged us to consider the construction of the colonial archive as a kind of ritual, full of sacred repetitions, and (re)collections. She revealed how the archive can recuperate alternative histories or forgotten histories, in particular those of non-normative sexualities, and asked us to consider where the history of sexuality can be located in archives of the colonial period. Arondekar investigated the role of the archive in erasing, creating, and perpetuating certain narratives as well as the possibility of constructing a recuperative hermeneutics vis-à-vis the historiography of sexuality. *Stay tuned for reports on the final panels of the day – “Dismantled Norms: The Modern and Contemporary,” “Collecting South Asia by the Bay,” and “The Materiality of the Archive: Viewing the South Asia Collection” – by my esteemed colleagues Shivani Sud and Padma Maitland. Also, be sure to check out Padma’s new exhibition at BAM, The Elephant’s Eye!